It's amazing what we can see if we only pay attention to our surroundings. 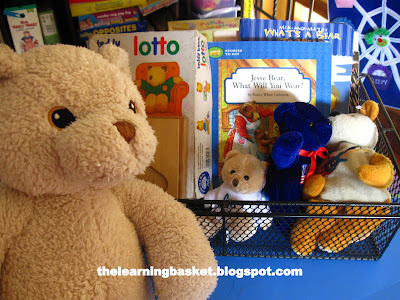 Jesse Bear, What Will You Wear? by Nancy White Carlstrom follows Jesse Bear as he goes through his day, waking up, dressing up, playing outside, eating, and sleeping. It is brimming with learning ideas on every page. We explored patterns, flowers, rhymes, and tried to pick up objects with our toes, just like the rose between Jesse Bear’s toes! As usual, I am only writing about the highlights of our week. PATTERN RECOGNITION Little T absolutely loves to move so I make sure that we roam about to keep her interest. For Jesse Bear, we had fun looking for different patterns around the house. Notable patterns were the flowers on a trash can, the dogs on Baby Boy’s onesie, polka dots on Little T’s bag, and plaids and stripes on clothes. 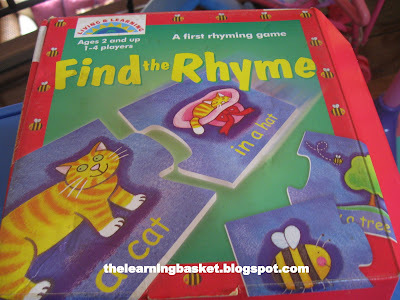 PRE-READING, FINE MOTOR SKILLS Little T LOVES rhymes. When I told her that we would be doing rhymes after we read the book, she said she knew what we would do next, and took out our rhyme puzzle game, which I totally forgot we had. This game is wonderful for sounding out words and strengthening her fine motor skills which would help her in writing later on. Puzzles are great for fine motor skills. This one has an added bonus of working on pre-reading skills! 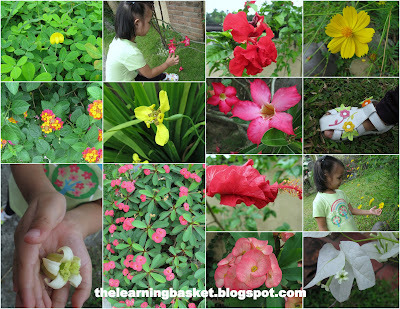 EXPLORATION, DISCOVERY, ART Since Jesse Bear's art work is full of flowers, we explored our garden and neighborhood to look at flowers. It's amazing what we can see if only we pay attention to our surroundings! (See picture above for the flowers that we saw!) 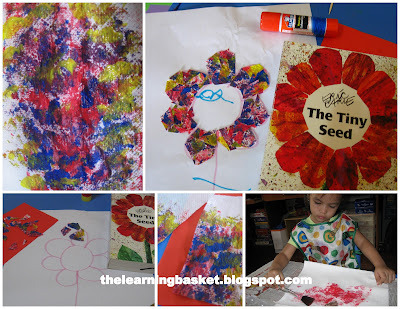 We then read The Flower Seed and did an Eric Carle-inspired art work, a simplified version of a pre-kindergarten art lesson that I found and seem to have enjoyed more! Pre-K art that I seem to have enjoyed more! SCIENCE Of course, planting actual sunflower seeds was part of the experience! I tasked Little T to water her plant every morning while Baby Boy is out getting sunned. 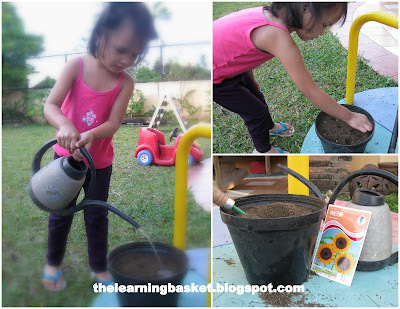 Little T tweaked a song she learned from Kindermusik: I can plant a flower seed, just like this, just like this! Have fun! Babyhood and toddlerhood are the best time to enjoy our children. hahaha! our sunflower bloomed after a few months, when we have all but forgotten about it! The activities you've shared can definitely develop the kids' interest and care for our nature. 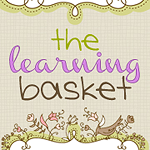 Hope to read more blogs from The Learning Basket when my baby is over a year old.